Translation: What happens when you buy a commodity. The very first Translation blog post that I posted started off with a quotation from Benjamin Franklin, “The bitterness of poor quality remains long after the sweetness of low price is forgotten.” and established our commitment to quality and quality assurance. It is truly something I believe in and instill in new hires when training the translation team here at Foreign Credits. If we are going to do something, we are going to do it well in order to deliver the best quality translations at a fair price. As a company that offers credential evaluations as well as translations, we are in a very unique position in that we see what other Language Service providers deliver. A lot of the providers whose translations we receive offer bottom-barrel pricing and sell translation as a commodity rather than a service (see Translation: Service or Commodity?). Below are examples of translations we have received that were done by said companies. These examples prove that you truly get what you pay for and when a translation is concerning your academic credentials, buying a service is much preferable to buying a commodity. Furthermore, these examples are ones from fairly common language pairs (German, Spanish and French into English) and I assure you, finding good-quality providers for these language pairs is easy to do. This first one was done from German into English. As can be observed, there is a typographical error in the translation of FAKULTÄT – FCAULTY; which would not be that bad except that the original document had attached an original English Translation to the German Text (see below). And still further, we have the following typographical error. While typographical errors are minor infractions, they are magnified by the fact that these misspellings in the final translation could have been avoided if the project manager had been more careful to notice that an original translation was attached, if the translator had been more attentive when re-typing the original translation for proper certification, or if any among the Project Manager, Translator, or Quality Assurance (the issuing company talks of a QA step in their workflow) had thought to run a simple spell check. Moreover, in a document of eighty words, two errors such as these lend to the questioning of the translation’s validity entirely. This next translation was of a document from Mexico. In this case, the translator had shamelessly changed the names of courses to something they were not thereby invalidating the translation as a whole. The customer was then asked to pay for a second translation, one that truly represented the source documents’ content. The coursework was for a program in agriculture. I truly wish I were fabricating this information; however, this is what the original translation company provided. For the life of me, I cannot even try to understand how a translator thought these translations of the coursework were alright to submit. 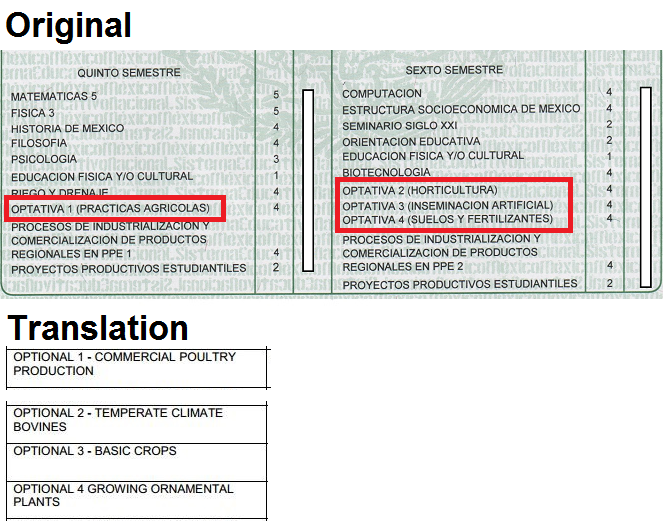 As can be seen below, the translations of Commercial Poultry Production, Temperate Climate Bovines, Basic Crops, and Growing Ornamental Plants are nowhere near being close to conveying the idea of an Agricultural Practicum, Horticulture, Artificial Insemination or Soils and Fertilizers (respectively). This last example comes from the translation of a Doctoral diploma from France. In this instance, a French pronoun which refers to the physical diploma itself was left in place and does not have any meaning whatsoever in English. It should be noted that this translation was issued by the same company that completed the first example. 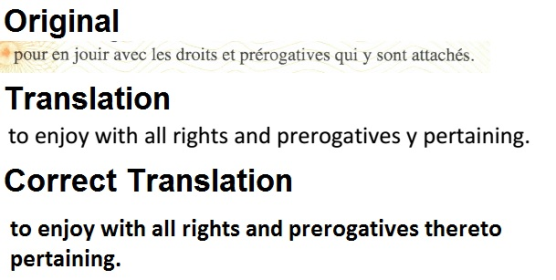 Additionally, I should add that that phrase, “pour en jouir avec les droits et prérogatives qui y sont attachés.” is a very common phrase and present on almost all degree-granting certificates from France and its translation; therefore, is equally as common. In conclusion, it can now be observed that you truly do get what you pay for when it comes to translations. How much money can really be saved in ordering a translation based on low price when the resulting first translation is so poor that the document needs to be re-translated to be done properly? All three translations were certified translations done by companies and were accompanied by a certification statement. In researching the companies that issued the translations, both of them obscured their quality assurance workflows if they mentioned quality at all. At Foreign Credits, we believe in transparency in our procedures. You can trust us to deliver the best possible translation because we have in place and adhere to a quality assurance policy in order to minimize errors. Aside from the procedural protocol in place, we also have two members of the staff who hold Master’s degrees in Language and Linguistics; in addition, all members of the translation staff have taught language for at least two years at either the secondary or post-secondary level. We know language. It’s our profession. It’s our passion. When you choose to have your academic credentials evaluated by Foreign Credits, you can trust that we will accurately review your coursework and accurately assign credits and grades as if you attended these courses within the U.S. education system. One of the benefits to choosing Foreign Credits for this service is that we offer Translation and Evaluation under one roof. You only need to deliver your academic documents to us via our online submission system and we take it from there! You may be asking yourself, why must I order an Evaluation if all I want is for my transcript (marks sheet) to be translated? Shouldn’t translation include ‘translating my grades’? Your grades, as well as the degree conferred, are part of an education system and are given on a grading scale which cannot be expressed through pure translation. Our translation-expert staff take your transcripts and certificates and recreate them in English so that our evaluators may then recognize all of your coursework and education attended and completed. They then spend time to research and apply their expertise to convert your grades, create your GPA, and assign a U.S. equivalent degree obtained. In short, the difference between grade/degree translation and evaluation, is that translation focuses on the literal meaning of the text on each page you submit while evaluation delves into the behind-the-scenes meaning of the names and numbers.